You have heard a lot about how you will be spending your time. You’ve learned about housing and dining and clubs and hiking trials and the ARC and Boba on Ring Road. But as you begin this adventure I want to remind you why you are really here, or to put it another way, why this great university was built in the first place a little more than 50 years ago. A public research university is created to serve the people by creating and transmitting knowledge. This is why we built this extraordinary campus, with amazing learning spaces, great labs, studios, libraries, clinics, and beautiful grounds. This is why we recruited a faculty comprising women and men who are the very best in the world in their disciplines, scholars and creators and professionals who are making fundamental contributions to new knowledge, creative expression, and clinical and professional practice. They are amazing. They will change your life. And they can’t wait to get to know you! We serve you by exposing you to the best that has ever been thought, created, or discovered, and by creating the conditions for hard thought and difficult debate so that you can learn how to distinguish half-baked opinions from well-earned ones. You all understand how much society needs you to be educated and knowledgeable, to live your life dedicated to the pursuit of the truth, and to get outside those social media echo-chambers where you are only exposed to views that flatter your existing opinions and interests. We serve the well-being of society more generally by incubating better ways of thinking about our natural world, or our political practices, or our values, and by subjecting outmoded or harmful ideas to critical scrutiny. In short, you are entering a world of ideas. 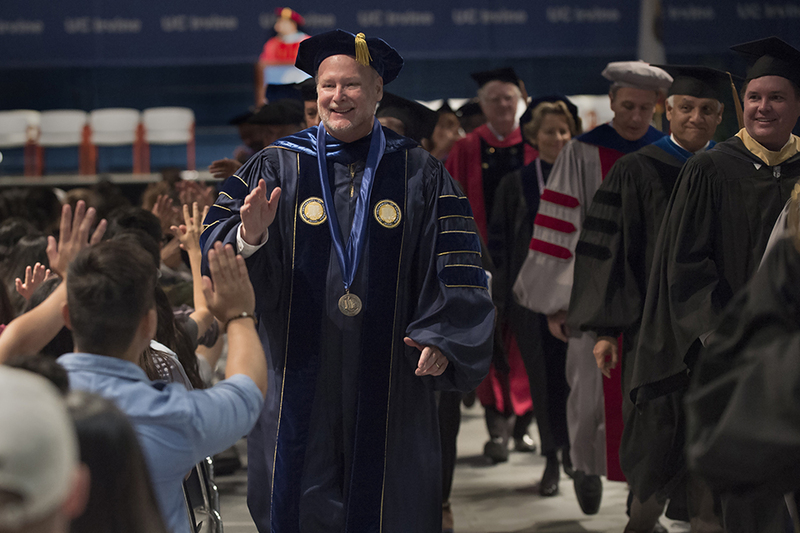 During your time at UCI you are in the business of hearing, understanding, and assessing ideas. You are here to see first-hand the personal and social benefits of building a community, not around indoctrination into sacred, immutable truths, but instead by nurturing an endless cycle of curiosity, inquiry, discovery, and skepticism – a cycle: curiosity, inquiry, discovery, and skepticism – where there is no protected orthodoxy of opinion, and where all knowledge is considered provisional, since history has taught the world that better ideas are always around the corner, whether we are talking about the nature of gravity, the virtues of democracy, or what should count as art. This all means that, over the next few years, some of your cherished views may be challenged. And so be prepared for that. But also, don’t worry about it. Finding yourself challenged by faculty, and fellow students, and even outsiders, comes with the territory of having made the decision to pursue higher education. It is, in fact, the entire point. We cannot and should not keep you safe from ideas in society that you don’t like. We are in the business of empowering you to engage ideas, not shielding you from ideas that we think you can’t handle. You are here to learn how to handle all ideas, regardless of how complex or controversial. This is why we cannot, and will not, censor or punish people merely because they express ideas we do not like. We will not deny someone access to a campus venue because of the content of their speech. We will protect members of the campus community, and their invited guests and speakers, from efforts to silence them through disruptive activities. We know that some of you may want to express views, or hear speakers, that are considered unacceptable by other members of the campus community; that’s what happens when you bring together a community with diverse backgrounds and perspectives. But even if you hold an opinion that is disfavored by others, we will act to protect you against any effort to undermine your rights. Of course, no one has a right to be free from criticism, and we will always ensure that members of the campus community can peacefully protest or hold competing events. This is because the proper response to speech we do not like is always more speech, not enforced silence. There is no need for me to tell you this if we are successful at nurturing a campus culture of mutual respect, where we have a genuine desire to engage competing perspectives and learn from those who have had different experiences and who hold different viewpoints, and where we address our disagreements through reasoned and sustained conversation, debate, and the acquisition of new knowledge.